Jennifer and Farhang have a loving, close, honest relationship. So much so, that they are open about wanting to murder someone for the thrill of it, together. What starts out as an intriguing fantasy, quickly turns into more than what they bargained for one of them. 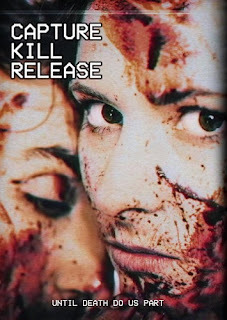 Written and directed by Nick McAnulty, Capture Kill Release is a found footage film that is also a part of the sub-genre using first-person view for the entirety of its ninety-six minute run time. Starring Jennifer Fraser, Farhang Ghaja, and Jon Gates, both main actors use their real names, adding to the feeling like you're watching a real found footage or documentary. Where most films usually fail using first-person, Capture Kill Release makes it work perfectly. From the beginning, they waste no time explaining why they are using the camera the way they are, and you are thrown right into the story. The dynamic between Jennifer and Farhang is believable--Jennifer is quite knowledgeable and at times comes off as a know it all, and can be really irksome. She is exactly what you would expect from this kind of role, as she is pretty much the female equivalent of Patrick Bateman from American Psycho (2000) and switches her emotions on and off like a switch. As far as character writing and execution, it’s a job well done. Farhang does a decent job and definitely holds up his end of the film, though at times he seems a little underwhelmed for the situation at hand. He is perhaps a more relatable character (we hope) yet he is still flawed, which makes him even more interesting to watch. Jon Gates plays the lovable loser who you immediately want to befriend and give all your good vibes to, he delivers his dry lines perfectly, and really comes off as genuine and thankful. For a found footage film, while it is still very much POV, the cinematography is excellent and it helps engage you with the story. Gone is the clichéd shaking and out of focus camera tricks and instead we have raw style footage. This is what makes this film what it is, it feels as if what we are seeing is actual found video of the events taking place. At times it seemed like the movie was going to end, and did not, it felt like an extended last scene. Perhaps one of the best parts of Capture Kill Release is the special effects! For indie films such as these, special effects are usually low budget and obviously fake, and you can't blame them, but it seems as though this flick put all their money where it mattered and it paid off. The blood is the ideal color and viscosity, and there is a certain body part that is used and it looks almost too real! I was pleasantly surprised and geeked to see how well done it was, kudos to that make up team. We have all had thoughts about killing someone before (don't deny it), and whether or not we just picture it in our heads, develop a plan around it, or even more so make an actual attempt to do it, Capture Kill Release is an entertaining look at an average couple's choice to murder someone. We get to see how it affects their lives—that way we don’t have to actually do it.